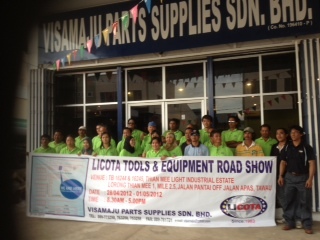 We had a successful event in Tawau, co-hosting the roadshow promotion with Visamaju Parts Supplies Sdn Bhd from 28 April 2012 to 1 May 2012. It’s the first time Licota had a roadshow event in Tawau. Here are some pictures snapped during the few days of promotion. Let's see if the nut will break, and if the bench vice is gripping it strongly! Surely the tools passed the test! This entry was posted on Thursday, May 10th, 2012 at 4:07 pm	and is filed under Events. You can follow any responses to this entry through the RSS 2.0 feed. Both comments and pings are currently closed.